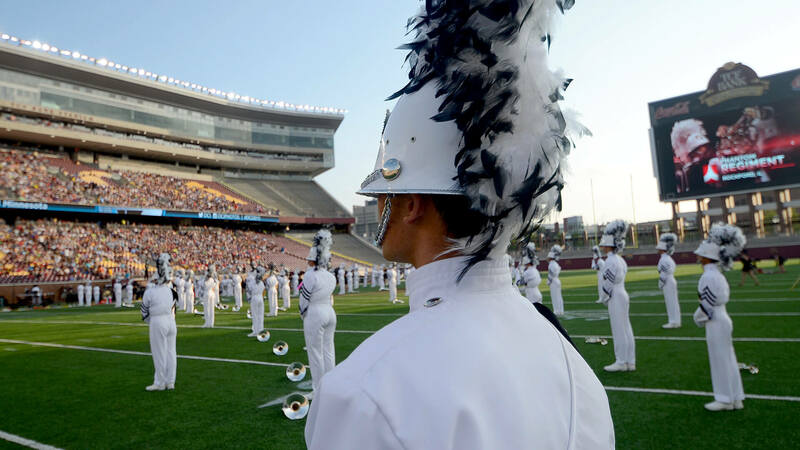 The Drum Corps International Tour is set to return to the University of Minnesota in 2016, with the institution’s TCF Bank Stadium confirmed for Saturday, July 16. First hosting a drum corps show in 2010, the more than 52,000-seat venue in Minneapolis has held DCI Tour events in five previous summers. The event will also feature performances by Minnesota’s two All-Age Class corps, Minnesota Brass and the Govenaires, a group that was named the 2015 Drum Corps Associates Class A World Champion. Also representing the Land of 10,000 Lakes will be Anoka’s Open Class corps River City Rhythm, who made its DCI Minnesota debut last summer. In World Class competition, this event annually marks one of the first times Midwestern drum corps fans get a chance to see corps from the West Coast. Groups like the Blue Devils, Santa Clara Vanguard and Blue Knights will arrive in Minneapolis by way of Denver the weekend before. Tickets for the 2016 edition of DCI Minnesota are expected to go on sale in mid-January.